Banana Pancakes – Colour your palate. Colour your soul. 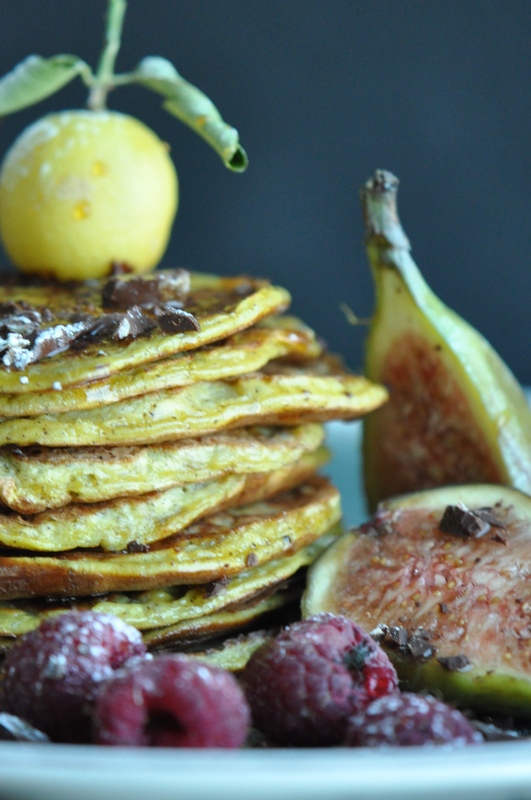 Gluten-free banana pancakes topped with dark orange chocolate flakes, drizzled with honey and accompanied by raspberries and figs – not bad for a healthy breakfast I’de say!! Ingredients: 3 organic eggs. 2 bananas cut into big chunks. 0.5 tsp baking powder. Raspberries (as many as you want). 2 figs (or as many as you want). Honey. Dark orange chocolate (I used Lindt). Pre-heat a non-stick frying pan at medium heat. Place the eggs, bananas and baking powder in a blender and blend at a very low setting (setting 1 in a Vitamix) for 5 seconds. The point of this is to mix the ingredients well, rather than to create a smooth product. There should still be small banana chunks in the mix. Pour the mix into a small measuring cup in order to obtain similarly sized pancakes every time. Pour the mix from the measuring cup into the pan. Leave to cook for about a minute on each side. Repeat until all the mix has finished. Using a sharp knife, grate some dark orange chocolate to create chocolate flakes, or chop up the chocolate into small pieces. To plate, stack the pancakes on top of each other drizzling a bit of honey between each layer. Crown the stack with the chocolate flakes. Place the raspberries and figs aside the pancakes and finally dust a little bit of icing sugar if you wish for aesthetics. Enjoy your breaky!